A few weeks ago I saw my first winter bird that shouldn't be here when I spotted a Green Heron along the Manayunk Canal in Philadelphia. I really don't like to be burdened with a camera and didn't have one that day. Though he was very close to me he flew before I could sketch him to the other side of the canal where he was much harder to see and sketch. Since then I've looked for him numerous times, including for the Christmas Bird Count. 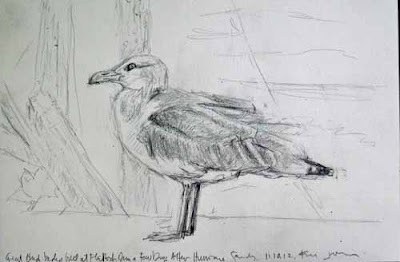 But given all the herons I've seen there I suspected that he might still be around. Sure enough I ran into him again today, again on my side of the canal, less than six feet away. This time I had deliberately brought my camera in case I ran into him or any other rarities. I really felt bad about not having photographic documentation of the Magnolia Warbler we saw later in December so I'm trying to carry it right now. Not that it did much good!! My Lumix FZ28(I think) is a good little camera, lightweight but with an 18x zoom, so it's a perfect compromise for someone who doesn't want to carry a camera. But it has a hard time deciding what to focus on at times. So if there are a lot of obstructions, e.g. twigs, between me and my subject it will often do a great job on the twigs and leave the bird out of focus. That was the case today with the Green Heron. Only one last shot as he was flying to opposite side of canal turned out well, miraculously getting him where he landed though I was trying to get him in flight. In any case that photo is at top. Below is one of the nearer but out of focus shots. Green Herons really should be gone by now. 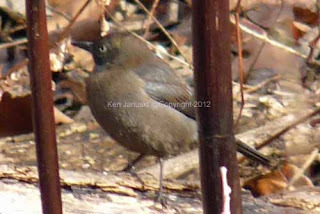 But I know one was sighted at John Heinz NWR in Philadelphia last January. Perhaps a few are sticking around due to milder winters. One of today's pleasant surprises along with the Green Heron was a bird I rarely see, a Rusty Blackbird. It's been at least five years since I've seen one, though they're also somewhat common at Heinz NWR in winter I think. Two photos are above. And finally a bird that is not a surprise at all, but still a welcome sight, a Great Blue Heron. This time of year they seem a little more focused on fishing and a little less skittish than the Green Heron I've been seeing. So it's a lot easier to sketch them without them spooking as they do in summer. Of course the 35 degree temperature still limits how much time I spend sketching. I was happy for this opportunity. 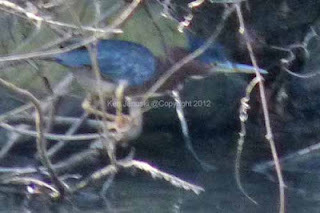 I just wish I'd been able to do it as well for the Green Heron. Hopefully he will stick around for the Philadelphia Mid-winter Bird Census in early January. It's been a long time since I skipped an image with a post. But outside of some recent photos of a backyard Cooper's Hawk and a seemingly odd-looking Hairy Woodpecker at Andorra natural area I have no images to show. So we draw a blank. But apropos of my last post on the 100th anniversary of abstract painting I'm currently rereading David J. Wagner's wonderful book American Wildlife Art. Most readers I think should enjoy it for the beautiful reproductions, but many may not like the amount of writing in it. As I reread it though I realize that the writing is actually the most striking part of it. The reason for this as with much history is that it helps to put our own seemingly unique world into perspective. It's not often that you find anything new under the sun, the internet and social networking notwithstanding. For me it's fascinating that in the early 1800s there was the same dichotomy between painterliness and versimilitude in art that used wildlife as subject. Certainly in American art today I think it's taken for granted that verisimilitude is primary. I certainly don't think it should be. And it's interesting to see that it wasn't always. 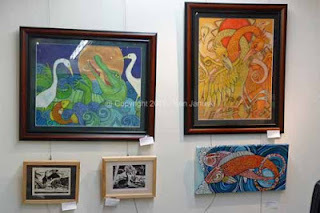 This is just one of many insights that the author gives into art, nature, nature sports and in particular wildlife art. One of the more surprising topics was Currier and Ives. I had no idea that in the 1800s almost 75% of images in Amercan homes came from them. Their exceptionally cheap prints made it very difficult for wildlife artists. How could they compete in price with the cheap price allowed my mechanical production of wildlife prints estimated to be in the hundreds of thousands per print? This reminds me of the extreme difficulty print journalism has today in the face of the internet. Of course Currier and Ives had to get their subject matter from artists just as online news today is often just a rehash or outright repetition of what a print journalist investigated and published. In either case it shows how culture changes, almost like a flooding river, changing everything in its path. I enjoy reading history, of wildife art or anything else, because it seems impossible to read it without reflectiong on what it says about current life. Often it says more than all the talking heads in pundit land. As far as the sales in the title I just wanted to let anyone who might be interested that all of my work for sale on etsy, both naturalistic and abstract is 10 % off throughout 2012. I realize that there may be few if any interested readers that are interested in this, especially after the huge sums that some people spend at Christmas. But just in case there are you should visit the sites in next few days. Type in TENPERCENTOFF in coupon area when checking out. to have the discount applied My naturalistoc work is at berkeleySU. Some of my older abstract work is at OldAndAbstract. I hope that there's some chance I'll finish that long-lingering heron reduction print before the new year. If so I'll post it here. If not, Happy New Year to all! Sadly I received the last or next to last print edition of Newsweek this week. I received it as a gift in its newest slimmed down version but I've very much enjoyed it, especially for the essays from various political perspectives. I hate, positively hate, reading anything online. It reminds me of eating cotton candy and seems incapable of substance. Still that is the way the world is going and there's nothing I can do about it other than pay for the print subscriptions I enjoy. The reason I mention this is that the latest issue had an essay by Blake Gopnik on a show celebrating the birth of abstract and non-objective art. As the article begins he mentions a now lost newsreel of 1912 that shows Art That Has No Subject! Not since the Italians invented fully realist painting, 500 years earlier, had visual art made such a huge leap. Up until that landmark fall of 1912, fine artists had always assumed their work would link up to the world, one way or another. Today many art lovers have forgotten how revolutionary this was. And yet to much of the population, including many lovers of naturalistic and wildlife art, it's as though it never happened. When I was a graduate student at Berkeley and Cornell I studied a lot of history along with studio art, which was my true field of study. I liked this as it seemed to confirm my suspicions about how art had developed over the years. In particular it was interesting to see throughout the 19th century a move away from detail, toward allowing more expressiveness in color, brushwork, composition. To me it seemed an inevitable separation of subject and method to the point where eventually method was stronger than subject and then eventually the subject was gone entirely. I'm not about to say that this was good! It just seemed inevitable. I recently read a biography of John Constable, Even this beloved naturalistic painter seemed to move toward greater expressiveness in his brushwork. Even Cezanne, whose letters showed that he wasn't trying to be an abstractionist but instead really portray exactly what he saw, made paintings where you couldn't help but notice the individual brushmarks, the rich sense of color, and of course the composition. I could rattle through a list of 19th century artists and show how the great majority moved in this direction. Suffice it to say: Corot, Manet, Monet, Gauguin, Degas. Studying the history of 19th century art is almost like reading a mystery novel. There is constant suspense, at least in the good ones. That suspense is based on just one question: when will subject matter be completely dispensed with? The answer seems to be 1912. At top is a pastel drawing and collage of mine that I did at least 20 years ago. It is called April. I show it mainly because I don't want to run into copyright problems showing the work illustrated in Gopnik's article. I'd be better off showing a Kandinsky, Malevich or Mondrian. But this is also appropriate because it wouldn't exist without the abstract/non-objective tradition. My work today is always a mixture of abstraction and naturalism. 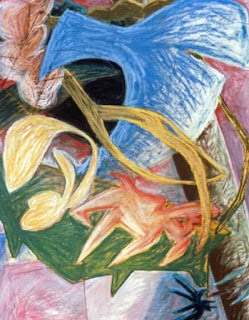 Even if it doesn't show in the work in my mind there is always a dialog if not a brawling argument between abstract and representational. The wildlife art world that I inhabit now has almost no truck with abstraction, except I think with sculptors for some unknown reason. I constantly feel an alien in that world because of my abstract background, almost my abstract DNA. Gopnik quotes the curator of the show as saying that the true nature of abstraction was not abstraction though. It was the idea of the heart ot art as being 'unsettling.' This is a common thought. But one I don't buy at all, and the reason I'm writing this post. It is true in the sense that most art today, at least that which comes out of the art schools, gets shown in the better galleries and museums, and has ignorant speculators masquerading as collectors lined up to buy it, does in fact see 'unsettling' as the recurrent theme. But it's not. Do you know what is unsettling today? Wildlife Art! 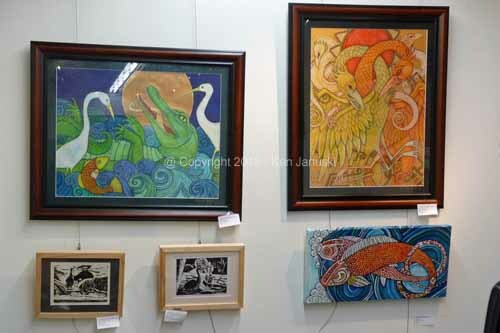 Ask yourself when you have last seen wildlife art, or just plain art that features animals or the outdoors at a quality museum or gallery. I'd bet that you can't. No one can. Why? Because for all the supposed diversity, plurality, openness of contemporary art there is one thing that cannot be tolerated: wildlife art. I'd offer a different theory of abstract art and the current state of art. As I said abstraction truly seemed inevitable throughout the 19th century. Artist after artist was pulled in its direction. But inevitably painting about nothing, just like writing about nothing or composing music about nothing becomes a dead end. It produced great art. Of that I don't have the slightest doubt. But all great ideas eventually lose their influence and get replaced or revised by something else. That something else today I think is the world of realism, especially the natural world. I know that this is heresy in the art world. And it's probably just as much a heresy in the wildlife art world where there's so little appreciation of abstract art. But art has always been very big. It ignores small minds and goes its own way. 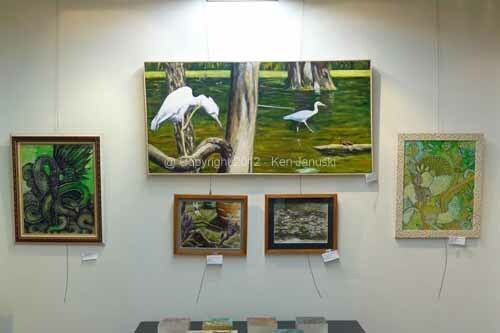 In 50 years my guess is that people will see that art struggled for meaning in the late 20th century and early 21st century and eventually found it in a return to subject matter, especially that of tne natural world. One other thing that was not part of abstraction, in fact I think had absolutely nothing to do with it was irony, the ennervated motivation of artists like Duchamp. It would be easy to say that irony is the true common thread of much art of the last 100 years and certainly of the last 50. But irony truly is a dead end, the cheap trick used by clever people to avoid engagement in the world. I don't believe anything of worth, in art or elsewhere, comes from the unengaged. And that's another reason I think why an art establishment totally wed to the ironic stance just can't stomach the true and honest enthusiasm many wildlife artists have for both their subject and the artistic media that they use to portray their subject. It is just too honest and heartfelt fo be acceptable! Here is the final Winter Wren lino, one of an edition of 24. My friend Ellen at The Spicebush Blog mentioned that it reminded her of a Carolina Wren due to bright supercilium and long tail. Sharp eyes! 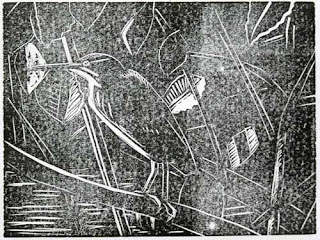 With lino there's only so much cross hatching you can do when trying to render a shade or gray. Because I didn't want to completely lose the supercilium by making it too dark I probably overcompensated and so it is a bit bright. As for the tail my wife Jerene also said she thought it looked too long. Since that was in an area I was thinking of changing anyway it was simple enough to shorten it. One of the first things you notice about Winter Wrens is how dark they are I think I've captured much of that here outside of the bright supercilium. The ideal solution is probably watercolor with its greater ability to render gradations of tone. Eventually I might print another small edition of this that I will then color with watercolor. The print by the way is 7x9 inches, with the image itself being just 4x6. It's printed with Gamblin oil-based ink(a combination of red and black) on Rives Lightweight paper. Most of these will be used as holiday greeting cards, but a few are now up for sale on Etsy. Because the ink is still wet I won't be able to ship them for a few days. 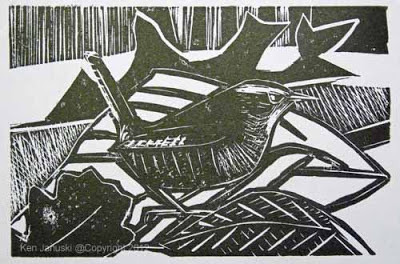 Above is something close to the last proof of a new Winter Wren lino. After seeing them on the Christmas Bird Count last weekend and doing a small watercolor based on field sketch I decided that a lino might make a good holiday greeting card. 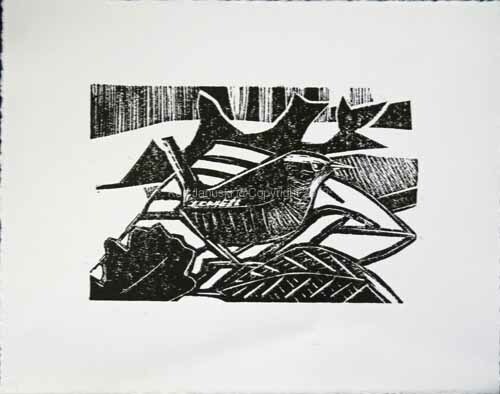 I'm anxious to get back to my reduction lino of the Green Heron but sometimes it pays to be patient and let things sit. So I decided to start this lino yesterday. As you can see it's simpler than normal for me. If I do anything more it will most likely be further simplification. 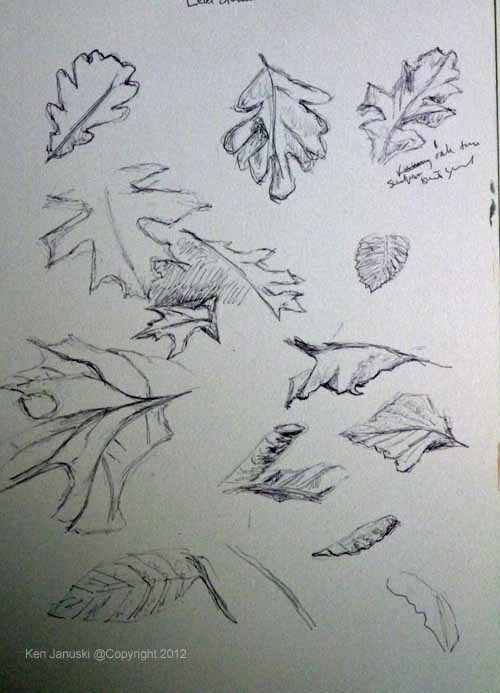 Before I began I did some leaf studies based on photos I've taken over the years, photos taken specifically for this purpose. Sometimes planning pays off! So above is a sheet of ballpoint pen sketches. I knew I wouldn't use them exactly as is but I was hoping that I'd gain some knowledge of the structure of various leaves that would help me in the print. Finally I needed to figure out just how the composition would work. Above are two studies. The print is based on the lower one though it has changed along the way. If I'm lucky I'll finish the proofing and perhaps print an edition tomorrow, much earlier than my usual schedule for the holidays. Normally I'm mailing these off on December 24th. Yesterday we took part in the Christmas Bird Count with Wyncote Audubon. I think we began cold weather birding at least 10 years ago. I've always loved the opportunity to be outside in cold weather, a relic of my childhood I guess, when winter was one grand though cold adventure. I'm not sure how many times I got home from my long walk back from grade school wondering if I'd finally gotten the treatened frostbite on my ears. I didn't care. I liked the long walk home in the cold and snow. Oddly I paid little attention to nature at this time. I didn't know birds, mammals, trees. I just liked being outside. 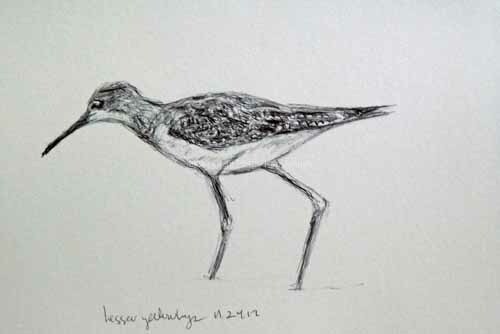 I think that is still a large part of my enjoyment of birding and is part of what I try to portray in my artwork. In any case the longer we've done this, especially in the same geographical area, the more knowledgeable we've become about what birds we might see. We also make a more determined effort to find them. One such bird is the Winter Wren, also known as Feathered Mouse. You can often hear them and often catch glimpses of them. But rarely do you get a long long at them, especially long enough to sketch them. Experience paid off yesterday. We saw at least two and possibly four. Both pairs were in the same location, Carpenter's Woods, separated by 100-200 yards. Though they're very small they move quickly. So it's most likely they were the same birds. Above is a quick field sketch of one of the birds. At top is a small 5x7 inch studio watercolor based on the field sketch. One of the pleasures of yesterday's views was that we stood stock still at one point and one wren didn't notice us. So he picked around in the leaf litter, often disappearing in it, just six feet away. It may have been the best look we've ever had. Even though we know that they disappear in leaf litter it's always shocking to see it happen in front of you. Thus the Feathered Mouse reference. They really do behave like small mice. We ran into an acquaintance at Carpenter's Woods who told us where an Eastern Screech Owl roosted and when if flew. 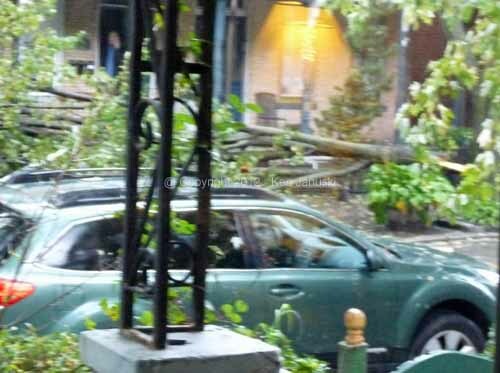 So we ended the day waiting outside that tree for an hour. Owls are always a treat. But I think the good views of two winter wrens was the best part of the day. We hoped to find the Green Heron I'd seen at the Manayunk Canal a 10-15 days ago but no such luck. We did see two Great Blue Herons, a couple of Pied-billed Grebes, one or two Brown Creepers, a Golden-crowned Kinglet and most of the birds you'd expect to see at this time of year in the habitat that we birded. Missing birds that we'd hoped to see were Pileated Woodpecker and Yellow-bellied Sapsucker. And not a single bird feeding on Poison Ivy, one of the most prevalent scenes of the last few weeks. One last note on the watercolor. 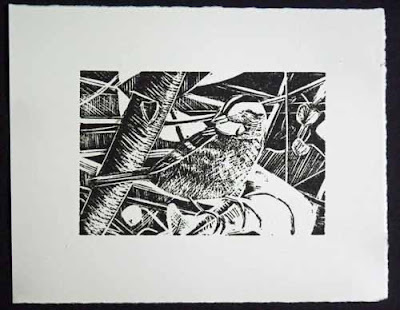 The Winter Wren is usually a dark bird in a dark environment. That makes for a difficult painting. 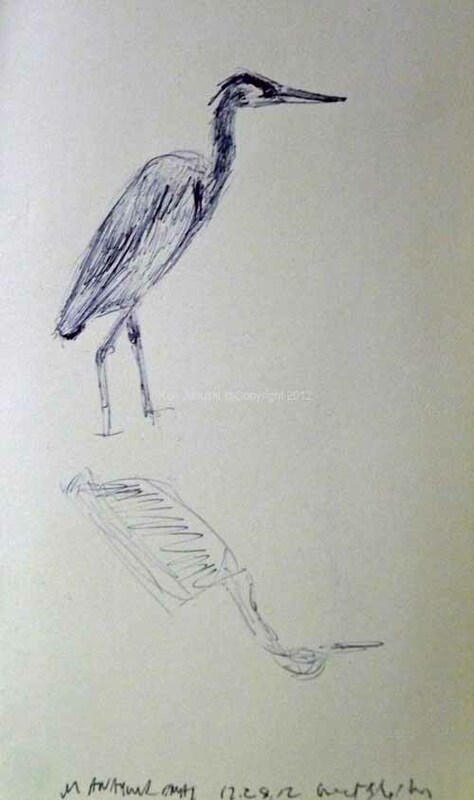 Should the artist make the bird as hard to see as it is in real life? I've decided not to do so in this painting. The surrounding environment in particular is lighter and brighter than it really was. But the bird I think stands out, as I'd like it to. Soon after I posted this I walked downstairs to find a juvenile Cooper's Hawk sitting right outside the kitchen window. Unlike the Winter Wren he held his pose for 30 minutes. So I couldn't resist getting the sketchbook back out. Finally printed the third color today, a Prussian Blue that looks mighty black because I have no white ink. Still I'm happy with it. I now need to let it marinate, over the Christmas Bird Count tomorrow and probably for a few days beyond that, while I decide what to do next. It seems inevitable that every time I write about avoiding the effects of photography in art I see something, generally using the optical devices of binoculars or scope, that shows something in nature of such beauty that I want to portray it just as it is, without any stylization or any other artistic modifications. Such was the case when I saw this Field Sparrow yesterday at Andorra Meadows in Philadelphia. More and more I'm struck by the subtle beauty of sparrows. 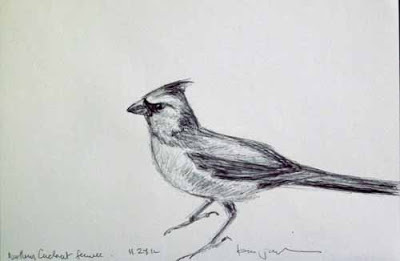 I had such a hard time just seeing this sparrow that I never thought about doing a developed sketch, though I did two quick field sketches from memory a few minutes after seeing him. 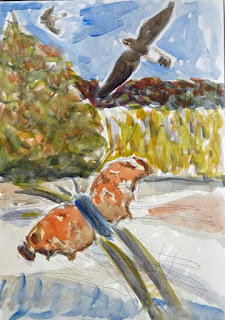 They and one successful photo from yesterday are the basis of this small 5x7 inch watercolor. I'm a bit off on the colors The gray in the head is lighter and more subtle. It is a truly beautiful bird. But I wonder how much of my reaction is due to the fact that my vision of it is based on a magnified view, 8x in my binoculars and 18x in my small Lumix camera. You have to wonder about artists who didn't have such technical help from optical devices. How did they see nature? Audubon of course shot his subjects so that he could examine them closely. But he'd also seen them enough in nature to know that they should be painted in animated poses, not the stiff ones of dead birds. He wasn't cowed by detail. I only bring this up because I really don't understand the mania for photographic realism in wildlife art. My reaction is: deadly dull! What at insult to the beauty and vitality of wildlife. 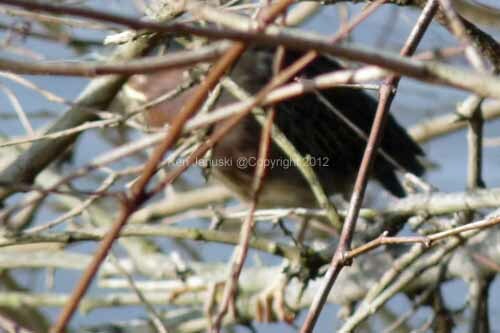 When I looked at this Field Sparrow yesterday I thought maybe I had a clue as to the motivation. The subtlety of tones, color, pattern in birds seen at high magnification is seductive, like the Sirens. Perhaps it's the beauty revealed through advanced optics that makes some artists helpless in the face of photographic detail. That's all they can see. It has captivated them, like the Sirens. 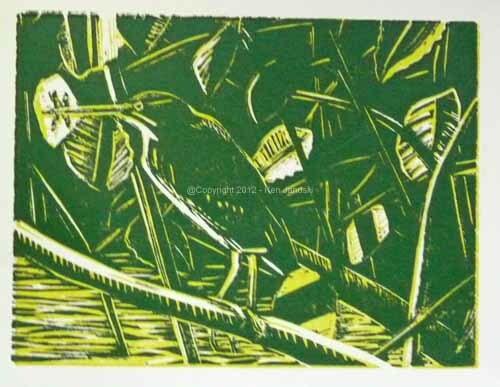 Today I printed the second color of the Green Heron with Twelve-spotted Skimmer linocut. And I'm no longer flying quite as blind. Once a darker color gets printed it's easier to see the entire print, unlike when there was just the one yellow color. 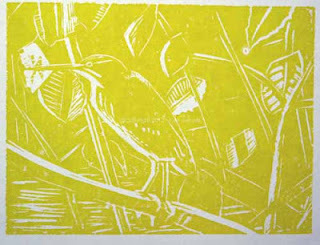 Still the yellow was necessary and it seemed best to print it as the first color. My plans include a blue for the heron and part of the background, a maroon/purple for the heron and possiblly the background, and a black. After that who knows? One thing I do know is that I wish my white ink would arrive soon so that I can add a tint or shade. Since it is a manufacturing problem however my guess is that the print will be completed without the use of white. I read an interview with a wildlife artitst today who mentioned that art was at least as important as realistic acccuracy in his work. That is exactly my thinking and I think that this print shows that philosophy. Unfortunately so much wildlife art seems enslaved to photographic realism and nothing more.For whatever reason this seems particularly true in American wildlife art. While sorting through a mixed flock of Eastern Bluebirds, Chipping Sparrows and Dark-eyed Juncos at Andorra Natural Area today my wife said that there was a not completely surprising kinglet near the ground behind us. Then she yelled out "NO". Given the time of year my mind raced quickly to figure out what unusual bird that might look like a kinglet might be here at this time of year. Before I decided that nothing did she yelled out "MAGNOLIA." Sure enough we had a Magnolia Warbler six feet away hover-gleaning just a few feet off the ground. He was gone in about a minute and it was only by comparing what we'd seen that we could say that it undoubtedly was a Magnolia. Since I didn't do a sketch and wouldn't have had time to take a photo even if I had a camera the watercolor above is based on a photo I took of a breeding male changed to the non-breeding plumage we saw today. It leaves a lot to be desired but still it documents successfully I think a very unusual bird to be seeing in Philadelphia in December! In retrospect I almost always like my reduction linocuts, the ones where I print the block in one color, cut away more lino and print in another color, and so on to the point where there's very little lino left by the time I'm done. I say in retrospect because sometimes the actual time spent developing the print can have more than its share of problems. 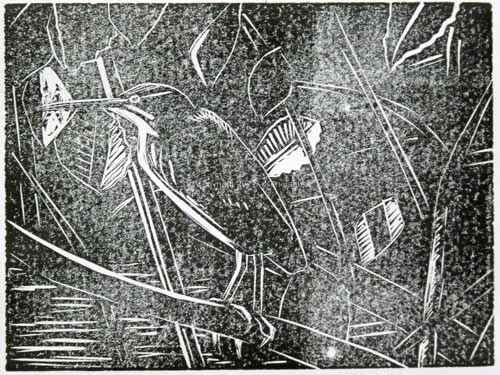 I don't do reduction linocuts to prove any technical mastery. More likely they show the opposite. Instead I do them because I like the end result, in particular the mismatched overlaps of color that give the print a jangly quality, reminiscent in some ways to the jazzy work of Stuart Davis, one of my abstract heros, or to Mondrian in Broadway Boogie-Woogie. I'm not trying to put myself in their company, always a danger when mentioning well known artists, but to help explain my motiivation. I think this jangly, jazzy feel is as appealing to some people as it is bothersome to others. I've sometimes theorized that this is due to a more urban versus more rural background but who really knows? I grew up a half block from farmland, lived in the large cities of Chicago, San Francisco and Philadelphia, where I still live, but more and more find my interest rural rather than urban. In spite of that my taste is still more for the jazzy. Perhaps it will pass! 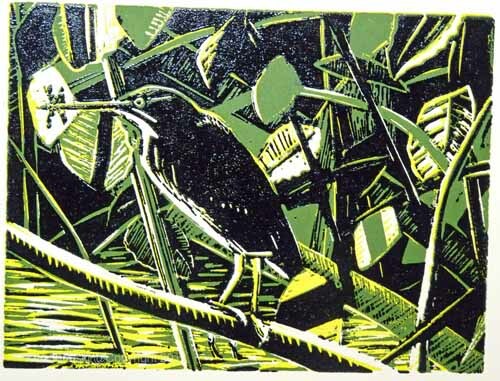 In any case I've decided that I want to do more reduction linocuts. When I do them I often tend to start off with a lighter color, then proceed to darker ones. But this is a bit like flying blind. It's really hard to even see the print when it's yellow on white. That's what you see at top. And the photo shows a stronger contrast than you can see in real life. That's where the 'flying blind' in title of post somes from. But as with watercolor it's the whites that will help to make the print sing. The only time I have to create them is when I make the first cut and print the first color. After that any future cuts will show the last color printed, not the white of the paper. After the first color is printed all future printing happens on top of the first prints. So when I carve out more lino and print in a new color what show through is not the white of the paper but the colors already printed. There are aome lino printers I suspect who think out in advance which color will go where and when, more or less. But I can't work that way. For me instead I need to print something and then respond to it, what I called process in the last post. This is part of the appeal of the lino process, especially reduction lino. The one big problem is that you can bet I'll find I want some more white areas as the print develops. And it will be too late by then to retrieve them. My only chance is on this first color. Because of that I also printed a slightly earlier proof of this in black ink. Black will most likely be the last color I use in the actual print. But I've used in here, printed on copier paper, just to allow me to see the contrast between ink and paper a bit better. I think this explains pretty well the phrase flying blind. But what about with obstacles, the last part of the title? Well there are a number of them. For one I can't order white ink in the brand I use because there's been a production problem. It should have shipped a week ago but it's still not ready. I thought I had some old white left and could get by with that for proofing. But what I had was just a tiny bit that included more specks of dry paint than of wet paint. That meant that when I used it I just got dry flakes of paint all over my print, my inking slab and other tools. The same thing happened with my old transparent base which I hoped to use to make the initial yellow transparent. Eventually I tossed those proofs and restarted with a brand new jar of yellow, free of dreid paint. But it's the lack of white which I suspect will be the real problem. I'm sure that as thsi print develops I'll want to use a tint or a gray version of a color. But I won't have the requisitie white to do so. So that will be an obstacle, but also might possibly result in a pleasant surprise. I'm rarely a technical person when it comes to art. But with printing it can't be avoided completely. So please excuse this brief foray into technical problems. If the print is successful these problems will just add to the success. I assume it's obvious what t he subject is but in case it's not: this is based on a watercolor I did this summer of a Green Heron holding a Twelve-spotted Skimmer in his bill, ready to eat it. 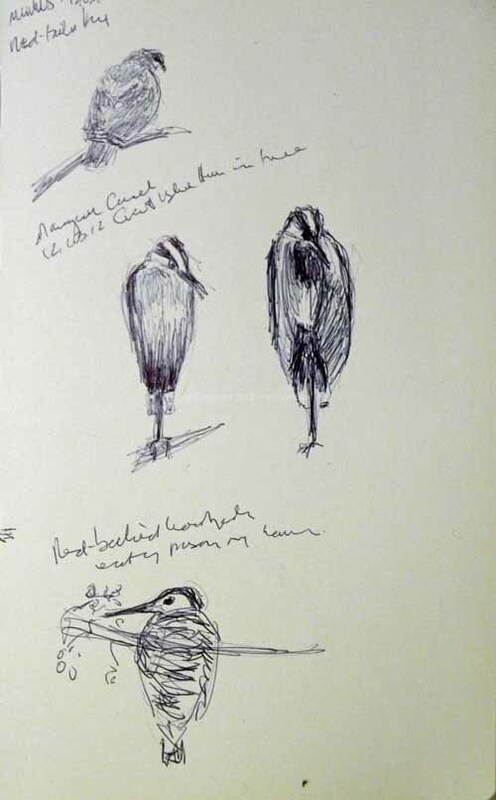 As I've continued reading Wildlife in Printmaking by Carry Akroyd from Langford Press two things have struck me: one, how many of the artists represented use their sketchbook as the source of their art, and two, how many consider the process of printmaking as important as the subject. Anyone who's not an artist might wonder what I mean by process. What I and most of the artists mean I think is that the surprises that come about as you develop the print are just as important as any plans that you might have had initially as to how the print would develop. When I was interviewed for Printsy, the printmakers of Etsy, a couple of years ago I said that one of the things I found that I most liked about printmaking was the element of surprise. That still holds true and I was surprised to see how many printmakers have the same feeling. It is somewhat like an improvisatory art. I could theorize forever about why this might be but I leave that to others. I don't know. But I do know that I very much like it. 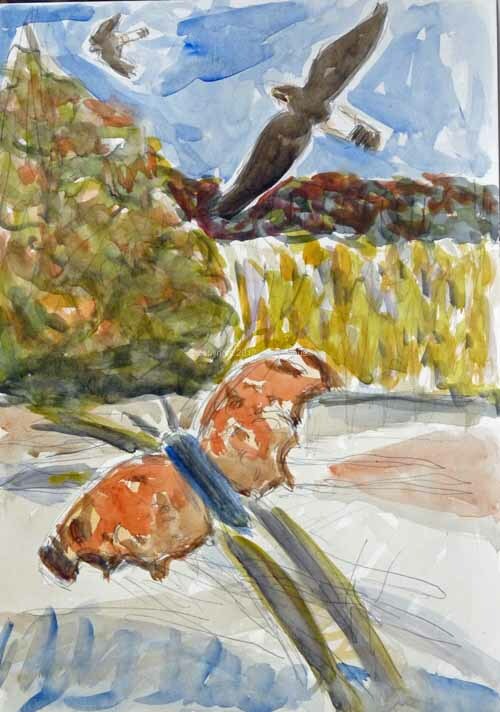 At top is a watercolor study composed from three field sketches done at Higbee Beach at Cape May last October. It epitomizes Cape May in fall to me with raptors floating overhead and butterfles and dragonflies keeping to the lower level. This is just a compositonal study, most likely for a color reduction linocut. 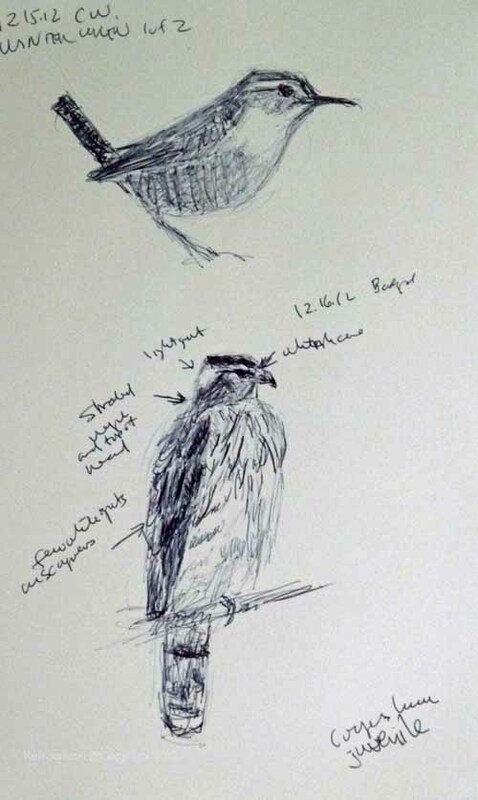 Above are two field sketches. At top the Red-tailed Hawk is from Morris Arboretum yesterday. The Great Blue Heron and the upside down Red-bellied Woodpecker eating poison ivy berries is from the Manayunk Canal today. The second sketch is also from the canal and shows a Pied-billed Grebe from memory, a Ruby-crowned Kinglet eating a moth, and a totally unexpected Green Heron off on the far side of the canal after I moved too close to try to get a better view for a sketch. Recently we've seen many Red-bellied Woodpeckers and Northern Flickers hanging upside down eating poison ivy berries. We also saw a Yellow-bellied Sapsucker doing the same thing last winter. This is a difficult pose to get right. 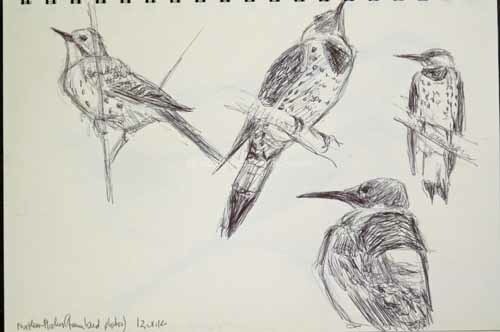 So I've done the sketches above from photos I've taken of Red-bellies and Flickers. 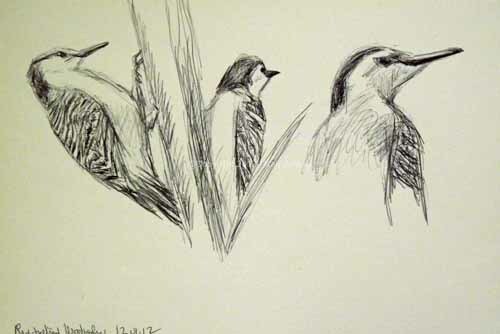 My hope is that such practice will help me to do more accurate drawings of these woodpeckers when I see them in the field. As with the watercolor at the top I hope to develop a painting or print from the sketches. 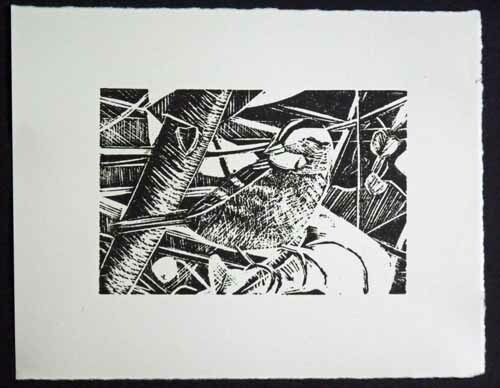 That's one of the wonderful things about many of the prints in Wildlife in Printmaking. They don't just capture the bird. They attempt to capture the entire experience. And they also improvise along the way, based on what their medium tells them. The result is joyous art. 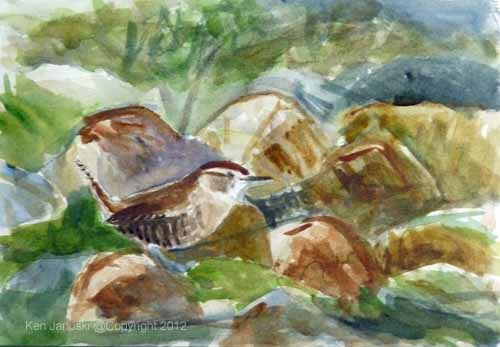 Many years ago when I first started taking art courses in the San Francisco area, even though I'd made art on my own since I was a child, there was one course that was a revelation to me: Oriental Brush Painting, as I think it was called. What was so unusual and revelatory was the importance of the brush mark. Each mark was important, not just the overall drawing/painting/impression. This was made even more noticeable in the actual practice of painting. The rice paper we painted on had a consistency similar to toilet paper. The black ink on the brush seemed to leap off the brush, even before it touched the paper, and form an indecipherable blob rather than the graceful mark I sought. What this taught me I think is that it's possible to make art that contains the most graceful and expressive marks, which are themselves a major component of the art. This course was only one semester long and I never began to master it. Still I've never lost my appreciation for it. So when I took up watercolor, after only the briefest foray into it as a student at Berkeley, I was quickly reminded of the importance of marks. Watercolor is not as absorbent as the rice paper I used to use but still an inelegant mark can show up as just that: inelegant. It's much harder to cover over such inelegance as you can in oil or acrylic. On the other hand some of my favorite watercolor artists such as Winslow Homer did seem to cover over areas. As far as I can tell Homer really wasn't all that interested in elegant marks. And no one can argue with his success as an artist. He's probably my favorite watercolor artist. I mentioned in my last post how the realism of the sketches I've done recently might soon be replaced by more abstract work, especially since I started reading Wildlife in Printmaking by Carry Akroyd. That is exactly what has happened in the 9x12 watercolor above. It revisits a familiar theme: shorebirds at high tide on Nummy Island. 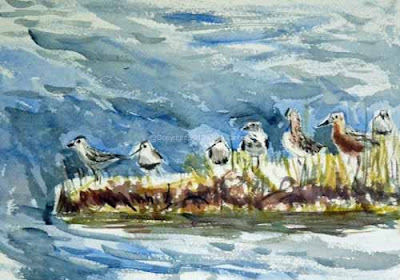 This one includes a Red Knot, as well as Short-billed Dowitcher, Black-bellied Plover and Dunlin. In it I've tried to keep more of the white of the paper, to accentuate a variety of marks, and to avoid too much detail in the birds, or anything else for that matter. I've always liked more abstract art and the Akroyd book reminds me of how much I like that sort of art. When I used to be an abstract artist I'd always use a musical analogy to try to explain it to befuddled onlookers. Most people don't demand that music tell a story or paint a picture. They react to the non-verbal music itself, to the melody, rhythm, etc. These are also important elements in art and are often noticed most in decorative arts though not completely. Architecture also makes much use of pattern and rhythm. When you use something like that in a painting you have to decide whether to sublimate accuracy for rhythm and pattern. I've made a first attempt at that here. Over the last few years I've occasionally made a painting that drifted in this direction then scuttled back to the safety of realism, which of course there's nothing wrong with. But my artistic background has always been much more appreciative of marks, of pattern, of design. So once again I'm taking a chance on that direction. This time I hope I can stay with it a bit longer. My linocuts I think do tend much more in this direction. But I've wanted to do it in painting for quite awhile and keep getting scared off. Hopefully this time will be different. 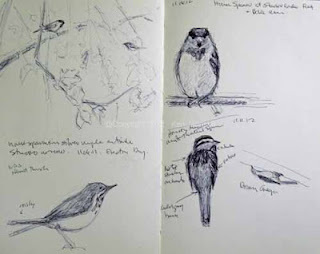 Ninety minutes of 30 degree birding at Morris Arboretum on Sunday reminded me that much of my field sketching is going to be on hold for the next 4-5 months. I could barely get my fingers to move enough to jot down what birds we saw, let alone sketch them. During the winter my sketches will be done very quickly. 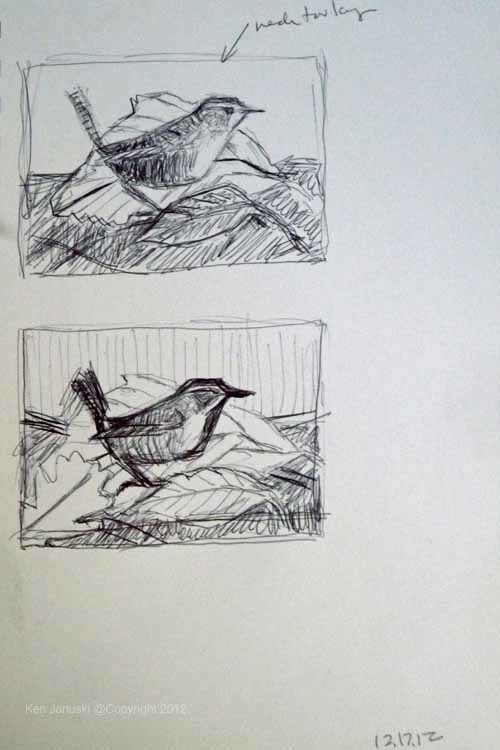 Often I've tried to do field sketches of Northern Mockingbirds in winter. Generally what strikes me is a very long torso and tail, or a very dark eye, or a very long bill and I'll try to capture one of those in a sketch. But then I'll come home, look at some photos and wonder where I got those ideas. So this fall when I took a photo that showed how long the torso of a Mockingbird can be I was quite happy. I've sketched that at top right above. I've also added the dark eye in most of the above sketches. The bill isn't really that long but it may be that a dark line in fron of the eye merges with the bill to make it look longer. If you look at the leftmost sketch though you can see how I can get confused. Here the Mocker looks more like a rounded grapefruit than a very elongated bird. I'm never happy with any attempts to do finished drawings from photos. They also seem lacking. 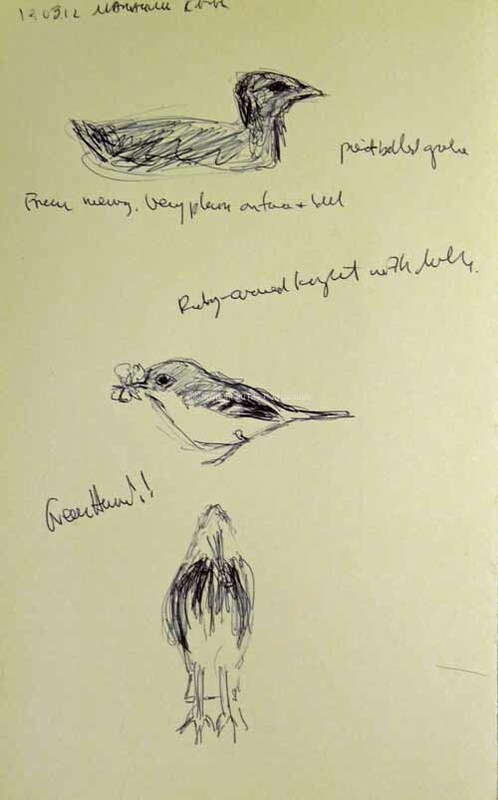 But for understanding the structure of a bird, particularly if they show the whole bird and in good light, the sketching can be informative. Northern Harries are quite different than Northern Mockingbirds in that I only see them on vacation. They're not a normal part of my local landscape like mockingbirds. They're magnificent birds to see but I almost never try to draw them as they drop down, lift back up, glide along then dip again, in constant movement. 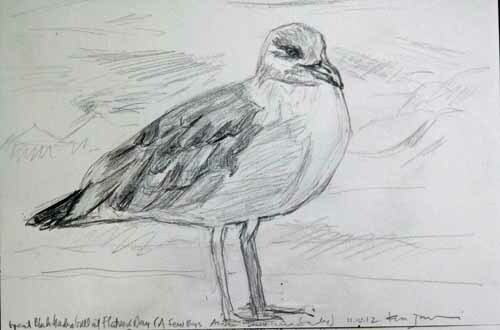 This year however I took my first photos at Cape May and also did a few brief sketches. 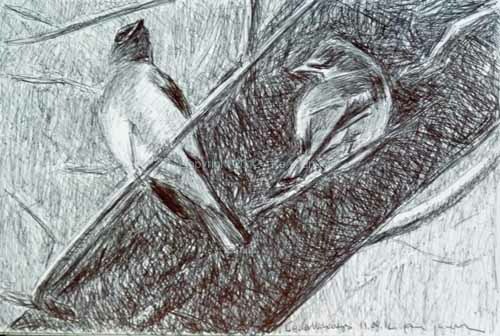 The sketch above combines two photos of the same bird into one sketch. 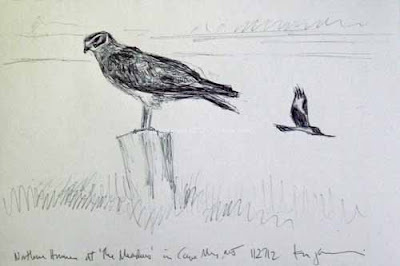 I've always admired other artist's drawings of harriers. It's nice to finally have my own. Yellowlegs are also a vacation bird primarily though they're occasionally at Morris Arboretum. They're more regularly at Tinicum but I just don't have the time to drive down there that often. So this was another opportunity to try to learn their structure, and complex patterning, a bit better. Finally we have the ubiquitous Northern Cardinal. Ubiquitous but impossible to draw from life. I'm not sure why this is unless it's the fact that the backyard ones are easily spooked. And then there is the black on the face of the male that I never seem to get right. Like the mockingbird they seem sleek one day and pot-bellied and heavy the next. I liked the way this photo gave a good sense of their structure so that was the impetus to do this sketch. 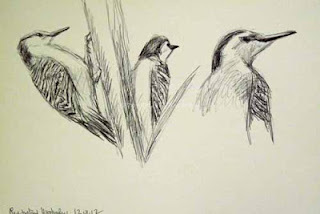 They should be regulars in the backyard this year so maybe I'll finally do some decent field sketches. 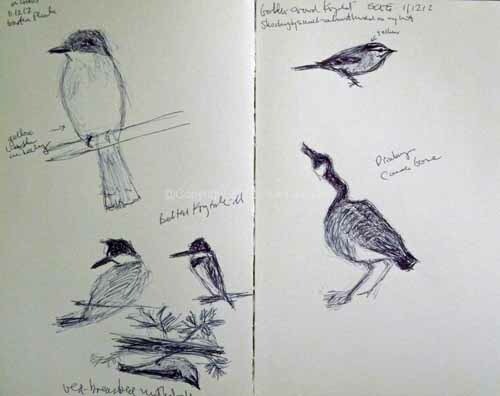 That really is the purpose of these ballpoint pen sketches from photos I've taken: to understand the structure of certain birds so that I can do a better job when I do field sketches of them. I recently received the wonderful book 'Wildlife in Printmaking' by Carry Ackroyd from Langford Press, publishers of the best wildlife art books in the world at least by my standards. As I've flipped through it I realize that the art I love is not limited by realism. It often takes great liberties with it. But it is founded in observation and knowledge of both the bird/animal and its surroundings. So I don't at all want to be trapped by the realism of these sketches, something quite easy to do I think. 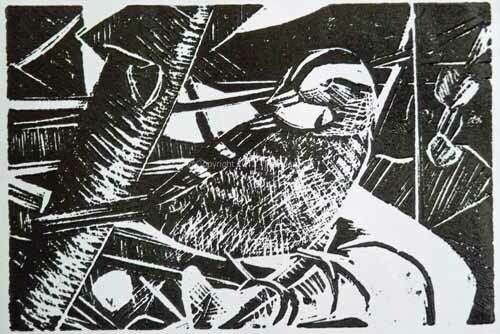 I hope that the knowledge I've gained will soon show itself in some much more abstract work, most likely in lino. About 20 years ago when I was a much more avid gardener I mentioned to a co-worker at the newspaper at which I worked that I just harvested something from the garden. One of the top level newspapers editors, with a good ear for cant, cackled back "HARVEST??!!". I never asked but my guess is that he was from a farm state where harvest meant something big, almost industrial. But I didn't back down. It was indeed a harvest, in the true sense of reaping the benefits of something that I and my wife had spent a long time nurturing. As he was one of the most likeable and humorous people there he didn't argue further. I think he understood what I meant. Now 20 years later it is still pretty much the same. We'll probably get our first hard frost tonight along with a bit of snow. I've kept a raised bed of hot peppers protected under tarps for the last few weeks, hoping that they'd finally ripen from green to red before I dried them in our dehydrator. It wasn't to be. 90% of the Anaheim style peppers will have to be dried green. The smaller, and hotter, serranos will be frozen and they're just as tasty green as red. 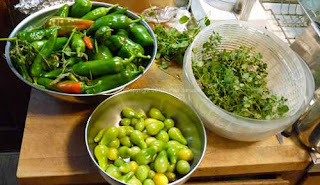 The few other milder peppers will probably be cooked as is or frozen for later use in a soup. Along with them is a bowl of Yellow Pear tomatoes. They are always prolific and pretty cold hardy. But I don't think they'll last the night so it was time to pick them. They'll slowly ripen to a beautiful lemon yellow and add to various meals. Finally my wife has been busy picking and drying herbs from our herb bed. Pictured here is some Greek Oregano a descendant of what we first planted 20 years ago. 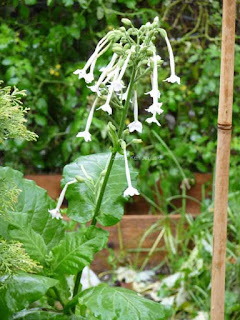 Sage, savory and mints have also been harvested. They'll be used this winter and probably beyond. As I've been able to devote more time to art and the business of art I've spent much less time writing about our garden and nature in general in this blog. But I haven't forgotten it. And it's nice to return to it occasionally. 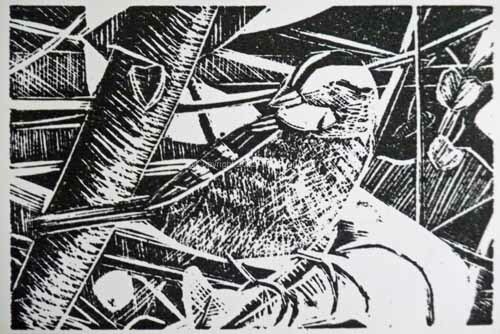 A few hours work and the edition of 15 White-throated Sparrow in Leaf Litter is done. The finished print uses Gamblin oil-based ink on Rives Heavyweight paper. The entire print is 7x9 inches and the image itself it 4x6 inches. It is for sale on my etsy store. This is also the final weekend to see my show Wild at Art, including the work of local artists Lynnette Shelley and Melanie Fisher at the Manayunk Roxborough Art Center. Last chance! 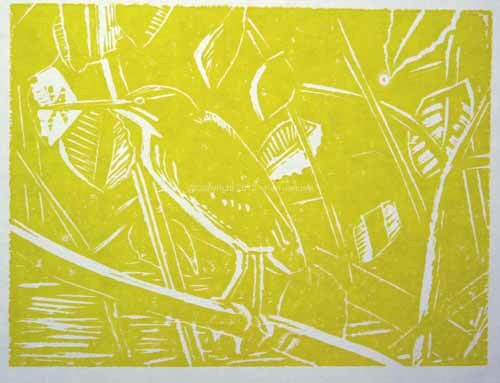 Above is the result of three-four hours of work on the White-throated Sparrow lino. Yesterday I mentioned that you often make decisions that you later have to live with in lino. That has happened here and the print has headed off in a slightly more abstract direction than I at first anticipated. Still I get nervous with strict naturalism so perhaps this veer toward abstraction is both good and inevitable, at least for me. This is a rough print, with the ink a little too tacky. That causes a loss of detail. In visualizing it with sharper lines however I think that it may be nearing completion. I had some apare time yesterday that I couldn't really devote to the lino so I did a few more sketches from photos, in this case photos I've taken of Swamp Sparrows over the last couple of years. The one on the right shows the peaked head that they often exhibit. 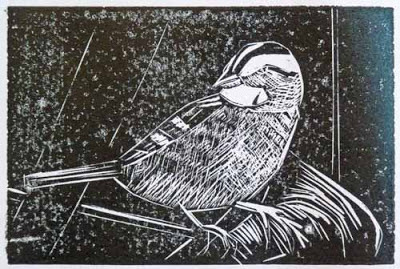 This is one of my favorite sparrows. 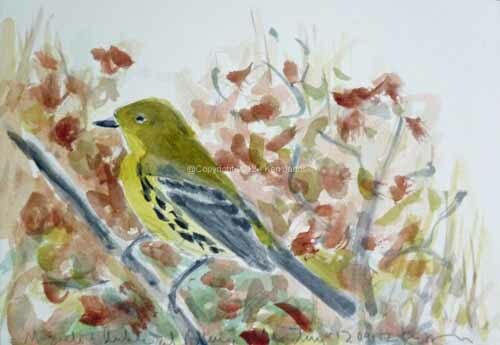 A small watercolor of one hangs at the Manayunk Roxborough Art Center for one more week in 'Wild at Art.' I have the feeling though that it will play a part in another print or painting soon. They are a really striking sparrow. A few more hours and about six more cuttings and proofs led to the proof above. I'm shocked how much there is to consider formally in a linocut. For some reason it seems that there are far more decisions to make than in a painting. I've made a number of decisions so far and they all have consequences as to how this will develop. 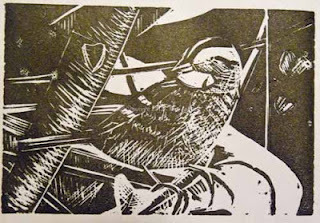 Though I often feel my strongest work over the last few years has been in the field of linocut I often go long stretches without doing any. Hopefully that is about to change. I've made large orders of ink and paper and perhaps will get some new carving tools for the holidays. That said here's an early state of a small 4x6 inch White-throated Sparrow. Part of the striking quality of this sparrow is the muted streaking of the breast and belly, something much more suited to watercolor than lino. Still I've decided to give it a try. Only time will tell if it was a wise move. As I was walking at Andorra Natural Preserve yesterday the brilliant, clear blue sky coupled with the yellows, oranges, even deep purple blacks of leaves got me to thinking that nature seems to offer one last burst of splendor before turning to the cold grays and browns of winter. The remaining birds however, with the exception of the Eastern Bluebirds and a few others, are more muted. Perhaps because of that, perhaps because they can be numerous, or perhaps because many of them dip into cover as soon as you try to identify them, sparrows can be given short shrift, especially by birders. If you look at them closely though they can be really beautiful birds. Among the most common but also the most beautiful is the White-throated Sparrow.. The reds, yellows, oranges of warblers are striking. But the combination of yellow lores, brilliant white throat and sometimes supercilium, coupled with a subtly muted gray breast, deep brown crown stripe and eyeline, and more brown variations of mantle and wings make for an equally striking bird. 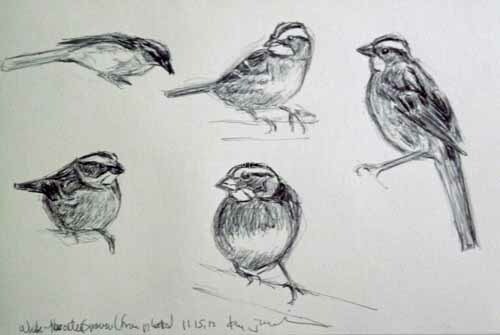 I don't know my sparrows as well as I should so I'm always looking for the opportunity to see more and in particular to sketch them. 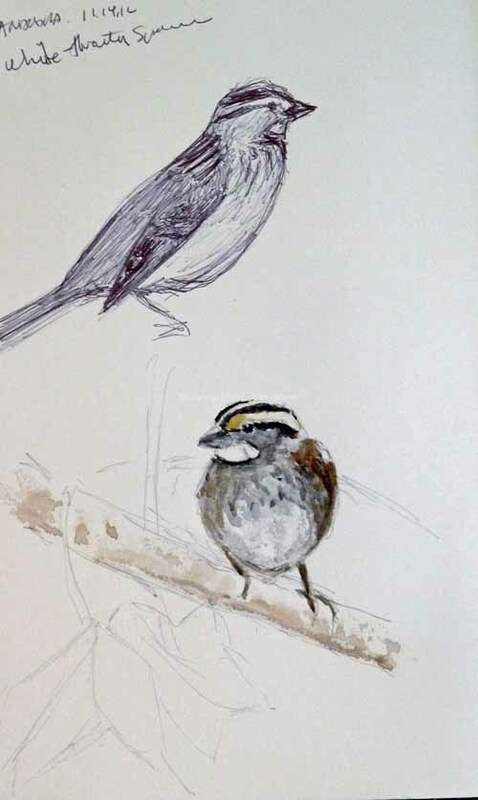 Above is a field sketch of a White-throat coupled with a small watercolor sketch based on a photo I took. I did the watercolor in the hopes of solidifying what I saw while out fieldsketching. This is a matter of both understanding them better to aid in identification as well as just being able to draw and paint them better. I also saw a lot of small, flitting Chipping Sparrows yesterday. 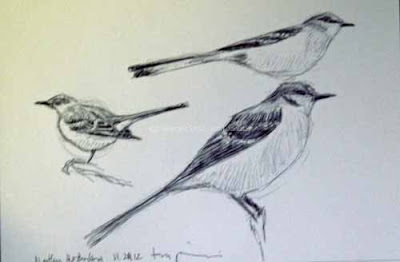 But they were too small and too far away for me to get any sketches of them. 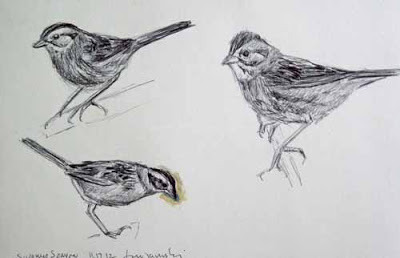 I'd of course like to see and draw rare sparrows but I'm also always on the lookout for the opportunity to draw more common but still striking sparrows such as the Chipping and the Swamp. 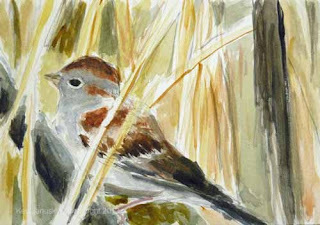 The blue grays of the Swamp Sparrow are a siren song to me. So one of these days I'll be back with them as subject. 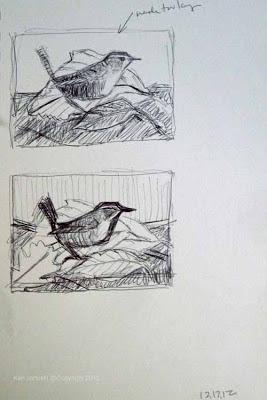 Oh yes, I did stretch out that top White-throat a bit. I was concentrating on a mental image that included the streaking on mantle, the facial markings and the way the wings hung down. While doing that I got the total proportions off a bit. Next time! After posting this I did a few more ballpoint pen sketches from my photos. They are the lower photo at top. It's probably accurate to say that I've never done a watercolor that I'm completely happy with. Or perhaps I'm happy with it, I can think of one such sold piece, but it's more of a study than a full painting. I really don't have the temperament or training for watercolor. My years of painting in acrylic and oil taught me that nothing is ever set in stone. I could always replace one color or tone with another. That's not the case with watercolor. You have to save some of the paper, letting it show through completely or at least trasnparently, so that the painting retains a sense of light. Light to me is watercolor's greatest appeal. If you do too much covering over, as if it were an acrylic or oil, you soon end up with a muddy mess. Knowing this it then becomes easy to be too careful, to plan so much that there is no sense of life at the end, almost likely a carefully colored in paint-by-number painting. All of which just goes to say that I'm eternally seeking success in watercolor. Sometimes I think I ought to first just be seeking a direction and worry about it being successful later on. I say this because I sometimes seem to veer between styles. In any case above you see another experiment in watercolor: two Killdeer on a sand/rock bar in the wetlands pond at Morris Arboretum. When I was looking at the photo today I actually thought about using it as the source of a linocut and decided to try a monochrome watercolor to that purpose. But I got carried away and it's no longer a monochrome. 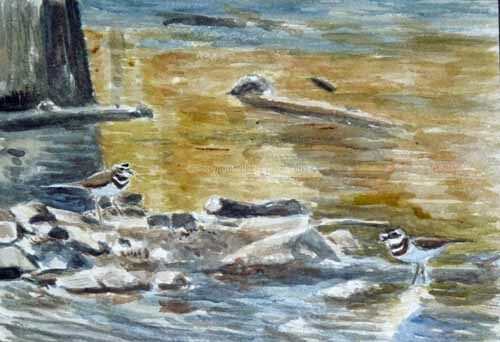 But I do like the scene, especially the almost handle-like tails of the Killdeer. I always enjoy discovering them on the sandbar, often needing to use my binoculars to see that there are actually birds there among all the muddy rocks. The cold light of tomorrow may show me how much work is left to be done here. With the change of time there's no longer adequate natural light to see this, even at 4:30 in the afternoon. So partially I'm posting it in order to see it in another light. The next morning and I inevitably made some changes. The newest and most likely finished version is now at top. Whether I continue working on it, consider it done, or abandon it I am happy to have been able to explore the composition of birds barely visible in their surroundings. They're always a pleasure to find in real life. I hope that will also hold true in a print or painting. I really can't complain about this. There needs to be some mechanism to screen out highly unlikely birds. But occasionally the screening process just doesn't match the facts on the ground very well. Normally I would call a Red-breasted Nuthatch rare in our area. But not this year. This is the fourth time we've seen them and we haven't really been birding all that much. 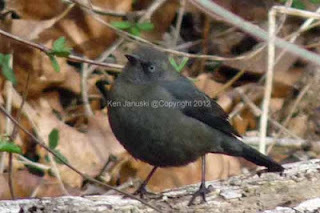 Same thing with the Easten Phoebe. It does seem a bit late for them but I'm pretty sure others have seen them elsewhere in Philadelphia over the last week. Yesterday ebird questioned the 10 Chipping Sparrows we saw at Houston Meadonw. They were there and probably in even greater numbers. I didn't have my camera with me yesterday but I did today. So why didn't I take photos in case someone questioned what I saw? Because it's no fun and the birds weren't that rare. I don't enjoy taking photos but I do enjoy making sketches. If the birds had seemed rare to me I would have tried to get some photos. But doing so always takes away from sketching time so I never do it unless I think the bird is 'rare' by my standards. I didn't intend to post these. But since ebird may ask for some proof here it is. Above you can see a young Eastern Phoebe at top left, followed by two views of a male Belted Kingfisher and a Red-breasted Nuthatch hanging upside down with his head thrown back at bottom. On right is a poorly sketched Golden-crowned Kinglet that was just one jump away from landing on my hat, which seemed to be his target until he veered away. Finally a Canada Goose drinking some water he'd gotten from the pond at Schuylkill Center for Environmental Education. 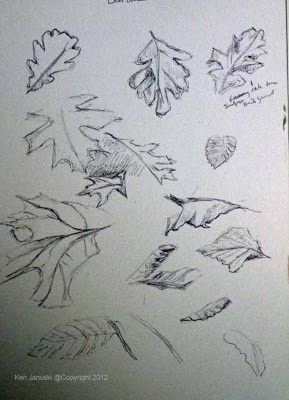 All of these sketches are from today, on what may be our last warm day of 2012. The sketches above are from the last week. On the left a couple of House Sparrows in the Silver Maple outside my studio and beneath them the first Hermit Thrush of the fall. 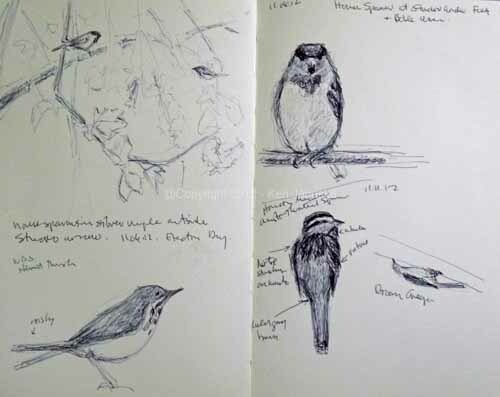 On the right pages a House Sparrow from my studio window feeder, a White-throated Sparrow where I tried to concentrate on the streaking on nape and finally our first Brown Creeper of the year, hanging upside down like the Red-breasted Nuthatch. I have a long way to go in perfecting upside-down poses but it's always fun to try. These field sketches from life are a far cry from the sketches from photos I last showed. They're both useful but believe me these sketches in the field are a lot more fun! 'Incisive' is often used to describe a person's mental abilities I think. It indicates sharpness, an ability to see the important things through all the unimportant when viewing a problem. I'm not claiming that for me or my drawings, at least not for me in particular. Actually it's almost the opposite. Almost all drawings are incisive. For me one of the most useful aspects of drawing is its ability to be incisive, to seek out the structure underneath the fluff and glitz. Not all drawing by every person does this. But most do. It seems to be almost a primordial part of Western drawing if not all drawing. I've written about this before but it always strikes me afresh. There's something almost analytical and surgical about sketching. You try to see underneath the murk to the real thing. I don't mean this in a mystical way, bur instead in a scientific way. I particularly mention it with these drawings because they're all done from photos I've taken. What I always find with photos is that I need to see beneath the surface of masses color or tone and figure out how the underlying object is put together. With birds it's a question of what those feasthers are on the back and how do they relate to the wing feathers. Where do the legs go into the torso and how is the bird balanced on them. For me, especially when working from photos like this, I feel like the pen or pencil I hold in my hand is like a scalpel trying to figure out the three-dimensional structure of what photography has turned into a flat two-dimentions. I'll in turn return it to the two dimenions of the paper on which I draw. But as I do so I want it to be informed by my understanding of its three dimensions. The drawing above is a pencil drawing on Stillman and Birn Gamma series sketchbook, size 7x10 inches. I haven't used these sketchbooks in awhile but they've always worked well for pencil sketches like this, among other things. Above is another sketch of the same Great Black-backed Gull seen near Flat Rock Dam on the Schuylkill River in Philadelphia a few days after Hurricane Sandy. I was there looking for any birds displaced to our area by the hurricane.Though I didn't really find any I always enjoy seeing some of our more common birds, including Great Black-backed Gulls. When I do drawings such as this I never intend them as finished works. Instead I do them with the intention of learning something. I hope that when I'm done I'll have a better idea of the structure of the bird drawn. That knowledge in turn will be put to use in some drawing, painting or print in the future. These two drawings were started while I gallery sat for 3 hours this morning at the 'Wild at Art' show I'm in at the Manayunk Roxborough Art Center. And there were no visitors! Come on local readers, assuming there are some, I/we need some visitors and some sales! Still it was time well used. But it would be nice to see more visitors to the gallery both for the current show and all shows. It's open 10 a.m. - 4 p.m. on Saturdays and Sundays. Yesterday I tried another drawing from a photo, this one a smaller ballpoint pen drawing of two Cedar Waxwings on Stillman and Birn Beta Series paper. The birds themselves are somewhat successful though both show I think that I couldn't fully understand their structure from looking at the photo I used as my source. Worse I really was not successful rendering the bark of the tree in which they perched. Still I learned something in doing so. I very rarely do a finished painting or print directly from a photo I've taken and never from someone else's photo. But these sort of sketches seem to exorcise the photos in some way so that I later feel more comfortable using the drawings as the start of a painting or print. I know it seems odd. But it's true nonetheless. I think one reason is that the sketches make me feel a little clearer about the structure of whatever I'm painting. They're also like a warmup exercise, like playing scales. All part of the process of making a work of art. During the hour before 'Wild at Art' opened last Sunday Brandon Lord Ross shot some video for a short film about the show and the artists in it. In the last 25 years or so I've been in two videos that I know of. I was a bit shocked by both of them, coming off as far more professorial than I'd really like. So I've been quite gun shy about video interviews for a good many years. But recently I saw one I liked by the artist Ewoud DeGroot Ewoud DeGroot at Wildlife Art Journal and it made me thinkg more positively about artist interviews/soliloquies. Lynnette also spoke highly of a video that Brandon made for another show of hers. So I decided to give it a try. Now that I see the results I have to agree, professorial or not. Good work Brandon! It's of course best to see the show in person. It's open Saturdays and Sundays in November from 10 to 4. But if you can't make it this will give you a good idea of the show and the artists. After voting yesterday Jerene and I took a walk along the Wissahickon. It's always a good way to get back to the real world and away from the hyped-up world of politics. Toward the end of our walk my second Hermit Thrush of the fall appeared on a pile of dead limbs along Gorgas Lane trail. Unlike most thrushes the Hermit will often sit still for a long time. So that allowed me time to do a field sketch. This is a small 5x7 inch watercolor based on it. When we got home we turned on the television and sat more or less glued to it until after 11. By that time the election had been called for Obama, at least by a few stations. Since I've talked for more about politics than I normally do recently I'm only going to say that we were both very pleased to see that a campaign that involved voter suppression, an extremely harmful Supreme Court decison, vast amounts of money that would have been better spent elsewhere and lies piled upon lies all based on the assumption that the voter is both stupid and easily manipulated failed. It FAILED. I don't care what your political party. Eveyone should be happy to see the end of such a campaign and hope that we never see such a one again. 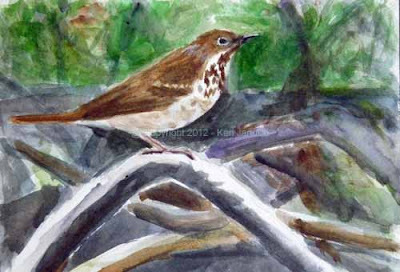 This Hermit Thrush was a bit of fresh air amidst all of that. Now there is very serious work to do in Washington. Let's hope that it finally gets done! Eventually I found a common denominator. The art I liked, regardless of style struck me as honest. I can't define what I mean by that or give anyone else any clues as to how they might define 'honest' art. I hate to think that the art I think 'honest' could be found 'dishonest' by others and vice versa. Still it may be true. 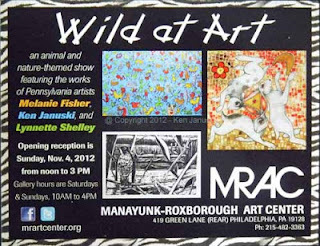 I mention this because after spending 4.5 hours yesterday helping to hang the 3-person show, 'Wild at Art' opening at the Manayunk Roxborough Art Center this Sunday I left with the feeling that this was a very good show. Why? I think it is all honest art. 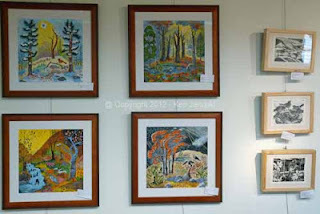 Above are three works by Lynnette Shelley and two of my own linocuts. Above a view of a short wall that includes my 'Two Little Blue Herons at Morris Arboretum" acrylic painting as well as two recent watercolors of mine and two more works by Lynnette. And finally four paintings by Melanie Fisher, with a deliberate nod to Charles Burchfield, and more of my own linocuts. I apologize for the poor quality of these photos. Any attempt to photograph more than one single work runs into problems of inadequate light, distracting reflections on glass, and numerous other problems. In this case the labels are still on work and need to be removed and transcribed onto price sheets. And some final straightening could be done. But I think it does give you a sense of what is there. It is, in my humble opinion, a collection of very strong work, all based in nature and particularly in animals. Hope to see you there this Sunday. It's difficult to find wildlife or animal based art in Philadelphia. This is your chance. There's no doubt in my mind that the worst decision of the U.S. Supreme Court in recent memory is Citizen's United. It allows unknown people to more or less buy elections. Most Americans believe this. Most likely the greatest amount of that spending will take place over the next few days. I suspect it will mainly lean Republican but can't say for sure. Here's my suggestion: Stop every single bit of it and donate it to the Red Cross for victims of Huricane Sandy. It serves no useful purpose other than possibly having unknown people buy an election result. By now there has been plenty of advertising. And there is a real use for this money, helping all those who have been devastated. The right and libertarians say government can't pay for everything. I understand the thought. It can't. But in times like these it can certainly do a whole lot. For the rest of what needs to be done I suggest that people who want government out of their lives put their money where their mouth is. Ask all SuperPACS to donate to the Red Cross.